LAT: 27:44, no errors. Few missteps due to the usual shenanigans, but nothing I didn’t guess my way out of in the end. WSJ: 39:27, 2 errors (closer to dumb than not). Nice gimmick, but took me a long while to figure out even with the revealer. Newsday: 56:15ish (wasn’t 100% exact on time for this one), no errors. Actually got one of these. Spent probably 25-30 min before I broke into this one to any significant degree. two. “YoAdrian” was new to me. Didn’t see the Rocky films. LAT: 30 minutes, no errors. Enjoyable, moderately difficult puzzle. My wife and I always enjoy the extras you provide to the answers. Keep up the good work. A quibble re 15-across. Sorry, but “not a soul” is not an answer to “Don’t tell anyone.” You wouldn’t walk up to a friend and say, “Not a soul.” It would be meaningless. “Keep it a secret” would be an answer to the clue. “No one at all” would be a clue for the answer. We got the correct answer because it fit into the puzzle, and not because it was appropriate, which is always annoying. I raised an eyebrow about this syntax of this one as well. I originally had NOT A peep which would be more common in that context IMO. Alas crosswords push the envelope when necessary. 19:06 after catching two typos…MIND GAMaS being the most ridiculous. I thought the 3-line 15-letter stack in the middle would cause me more problems than it really did. Newspeak was a real thing in the Soviet Union (and before it). For example, there is no really good or common word in Russian that means “to own”. Rather, you simply say “next to me there is a book” instead of “I have a book”. Lamentably, more and more in this country are realizing that controlling language is a way of controlling thought. A friend of mine who is a professor at UC Davis is originally from the Soviet Union and says what’s going on in this country with language control mirrors what she saw growing up in the USSR. Dirk – what’s the difference between honey I buy at a store and “raw” honey I see advertised? Do they just add some preservatives or do they do something else to the “raw” honey? 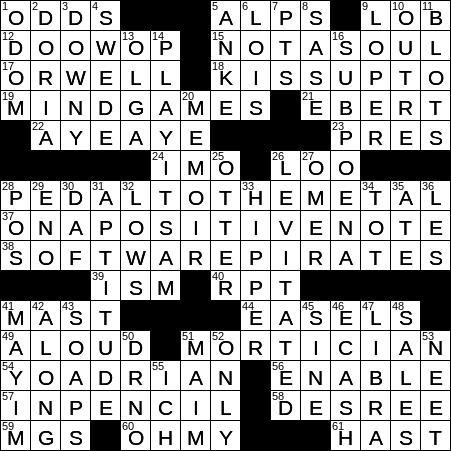 On a *negative* note… there’s a few of this puzzle’s clues and fills. YO ADRIAN?? Give me a *break*. 18 mins 4 sec before I had to give up, with two crossing errors in the top left, and 8 unfilled in the bottom left. This puzzle was just *evil*. >We got the correct answer because it fit into the puzzle, and not because it was appropriate, which is always annoying. Unfortunately, if you see my references to “shenanigans” or “nonsense” throughout this blog, you will find this to be a incredibly common occurrence with all crosswords. Sadly. >This puzzle was just *evil*. You may recall that I mentioned happening upon one of Rich Norris’s puzzle books. I ultimately ended up giving up on trying to do them, they being far worse than anything that appears in either the LAT or NYT. They were filled with clues that were completely useless or like described above. The only close thing that reminds me of these puzzles is Croce or the Saturday Newsday. Had to do this on-line, after I dumped a glass of water on my paper. Too much strange and new stuff for me to avoid peeking a few times at the red letters. Finished with 38:48 and 93% without help. @Jeff – Raw honey is generally never heated or just gently to say 90 F, the temperature inside the hive, and it has about a .4% pollen content, allowing you to potentially develop a tolerance to the local pollen allergies. It also contains all the enzymes the bees include with their conversion of nectar into honey, assuming it isn’t heated too much. I extract my honey and it flows through a wire mesh sieve and then I warm it gently and pour it through 600 mil screen, before bottling. Pollen can get as large as 250 mil. With regular honey, as I understand it, they can heat the honey to 160F and then they force it at high pressure through ultra fine filters, removing any pollen. This wrecks all the enzymes and you can’t analyze the pollen to determine where it is from. You basically just have fructose, glucose and a bit of maltose. Couldn’t access the blog on Friday night so didn’t post! FWIW– no errors on Friday, but I missed seeing y’all!